You don't want to underestimate the power of words. Last night while driving down the road listening to a CD that had been mentioned in the Newsletter there was a bit of cringing at some of the lyrics (it had taken a good 12 full listens ... over the last few months to the CD before the words weren't so harshly heard). This after having years of training desensitizing to words ... that words have only the meaning we give to them. That one take personal responsibility for how they hear something. It is the one hearing it who is responsible for the reaction to the words; not the one saying it. Like when one looks at a piece of Art, it is not the Artist responsibility to reveal to you what you see or experience, the same came up around this CD. It would be a wise teaching for children to learn as they are being taught a language, to remember what/who they are before the words/language. Then the possibility is there or is embedded so that they do not think words/thoughts are who they are, rather words/thoughts are something that has been taught to them so that they can communicate verbally. You weren't raised to believe that you are a Math problem and yet Words are just another language like Math. However, most people believe they can be described with words and that is like saying a Math equation can describe who you are. Both Math and Words are man-made; who you are is not. "You are not a Math equation and you are not a Word." Discover this and then point everyone, including children, to what both Math and Words appear In ... the Stillness that is You. Something else was revealed while listening to this CD. Whether it is known to the artist or not, his pushing the boundaries of this mind to go past the words to hear what they are In and then to hear the words as Music and then to return to the words (meanings) to see the picture being painted is very revealing and this is what one would call Art, when something is able to do this, however one must be willing to have ears to Hear it. Again it came up that it is not the words themselves but the energy the words ride upon, so there was a letting go (in a sense) of the meaning (that was thought) about the words and a relaxing into the music of the words, so that the words/lyrics themselves became Music, like an instrument (not pictures drawn from past experience), just sound and it became quite beautiful, you could hear the joy and the anger and the love and sadness, without meaning. And then compassion grew. Compassion breeds compassion. And compassion grew from Hearing this man's life, his experience ... the Art he reveals from how life is seen through his eyes. That he took the time to create something, to make one smile, to make them cringe, to make them think about things that are not easy to hear, to draw a picture with words of a life that may be difficult for some to imagine, let alone live, to shed light on dark situations, just by speaking of them. In this world, we are only as strong as our weakest link; that is what is said. However, there is NO weakness in what we are LINKED IN (no it's not a social networking club :o). The more one can begin to become Aware of what we are Linked In (for lack of a better word because link implies something that can be broken and what you are IN cannot be broken), the more you come from that Space, you will, in a sense, share it in anyway that it appears for you to do so. So stay a bit longer when words make you feel uncomfortable. Allow them to momentarily not mean anything at all. 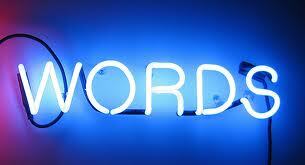 It is not words that create disharmony, it's one's belief in the words. The longer you can stay with the uncomfortableness; the more that is revealed. "There is no "I" in You."